The belt driven BOGE screw compressors are equipped with the patented GM drive system for optimisation of every operating phase. 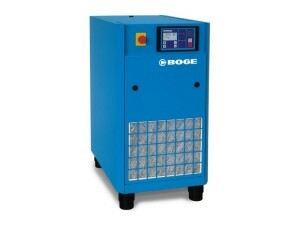 These BOGE compressed air stations are also available as super silenced compact units with horizontal refrigerant dryer – no additional space is required. Owing to the intelligent BOGE design, servicing and maintenance can be carried out from the front from one side. The cooling air flow from the cold lower side toward the top provides intensive cooling of the component parts. This is a clever feature because it serves to ensure a long service life and optimal compressed air quality!